The name Gaddi is derived from the word gaderan, the local name for the hilly tracts of Himachal Pradesh. 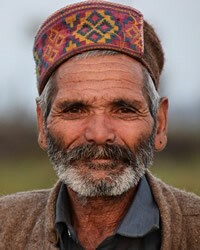 They are a Scheduled Tribe, and many make their living by sheep raising and farming. Divorce and remarriage are allowed. Women take part in agriculture and animal husbandry, and contribute to the family income. Gaddi villages are usually located on steep slopes. Each household consists of a nuclear family. Houses are generally two or three stories, with balconies and paved courtyards. The ground floor is used for keeping cattle, while the second story is used for living, sleeping, and cooking. The Gaddi follow Muslim or Hindu traditions, although many of their own animistic traditions are still practiced. Animal sacrifice is a common feature of their rituals. The literacy rate of this tribe is probably low. The Gospel message needs to come in oral forms as well as in written forms. Pray that believers living near the Gaddi will not ignore their situation but instead by drawn to share Christ with them. None of the Gaddi have reported themselves as Christians on the Indian census. However, please pray for those who will soon come to know and follow Jesus. Pray they will live holy lives, and will learn to live in the power of God's Spirit. Pray they will be accepted by the rest of their community. Pray for improved living conditions for this community, with better employment opportunities. View Gaddi (Muslim traditions) in all countries.